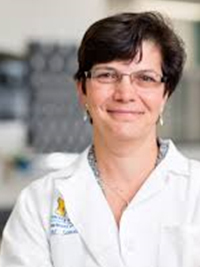 DIANE M. SIMEONE, MD, a pancreatic cancer surgeon and researcher, has made significant contributions to the pancreatic cancer field through investigating the molecular mechanisms important in the development and progression of pancreatic adenocarcinoma. With expertise in basic and translational research and extension of basic science findings into clinical trial design, she leads a large inter-disciplinary research program focused on understanding the basic mechanisms of pancreatic cancer biology and using that information to develop new diagnostics for early detection, more effective biomarkers for clinical use, and improved treatment modalities to benefit pancreatic cancer patients. In addition to her role as Scientific Advisory Board member of the Hirshberg Foundation, she is the incoming national chair of the Scientific and Medical Advisory Board of the Pancreatic Cancer Action Network’s board of directors and serves as the U.S. lead on the Precision Promise Clinical Trial Consortium, which focuses on developing novel, more effective clinical trial options for pancreatic cancer patients. Dr. Simeone has also served as president for the Society of University Surgeons and the American Pancreatic Association, is a member of the Institute of Medicine of the National Academy of Sciences, and serves on the Scientific Advisory Board for the NCI Pancreatic Cancer Task Force. To find a cure for pancreatic cancer in honor of Ron Hirshberg and the thousands of people who are diagnosed with this disease each year.